Children often benefit from having a special place in their home that’s all their own to focus on projects. Crafts, homework, home schooling…all can be improved with a dedicated table. Adding some creativity to that table can encourage a love for creating and learning. Even if your home is limited on space, there are options to choose from. We’ve compiled some of our favorites below. Don’t have a lot of space? This wall mounted Murphy Desk (secretary desk) from Reality Daydream is mounted on the wall and folds up when not in use. The side you see when it’s closed has a chalkboard, so it’s multi-functional. Cubbies inside hold pencils, crayons, scissors, etc. Best of all, Reality Daydream shares the plans for this project right on their website. Need something a little larger or for an older child? Shanty 2 Chic also has plans for a wall-mounted Murphy Desk. This one also has a chalkboard, but it folds out into a larger table with legs, so it takes up more room. 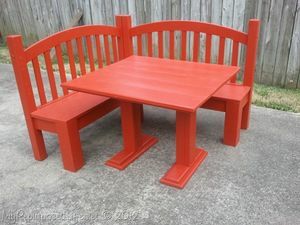 Buying individual tables for a homeschool classroom can be costly, unless you purchase them from yard sales or thrift stores. But building a classroom that way can result in wasted space. Good news! 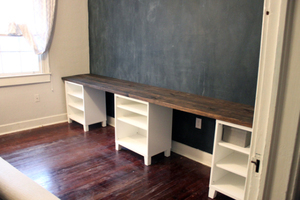 You can build homeschooling stations for the cost of one sturdy table. 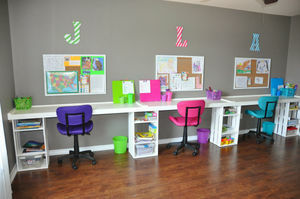 This home classroom from Right Where We Are is a good example of what homeschooling stations can look like. We love the bright colors, individual storage spaces, customization for each child, and cork boards for displaying important information, but RWWA didn’t share how they made the table. Caitlin at Icing on the Cake made a similar adult set-up and explained how she and her husband put together the double desks. Their design could very well be adapted to fit your homeschooling needs. One of the latest trends in DIY furniture is industrial shelving. What’s great about it is that it can be adjusted to fit almost any space – a large wall, a nook, or even a corner. 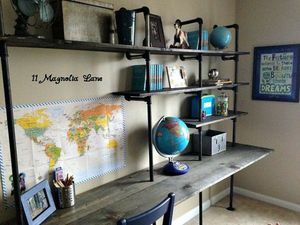 Terry at 11 Magnolia Lane created this industrial shelving and desk in her son’s room. Instructions for creating industrial shelving can be found linked at the bottom of her blog post. Sometimes you don’t know exactly how a homework area will be used or you want to give the child power to design it themselves. That’s where a flexible workspace design can be advantageous. Steph at Bonville created this homework space with IKEA furniture and pegboard, which allows for the storage components to be moved around. You can see the product list and more pictures on her website. 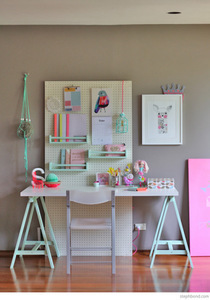 House on Ashwell also has a good example of a kid’s desk that uses pegboard for organizing. They used a frame and painted the pegboard a pretty pink to match the wall it’s mounted on. 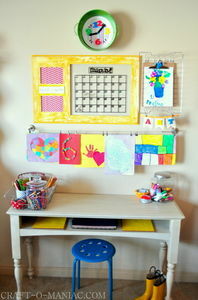 A simple desk can often be spiced up with some great wall organizers. 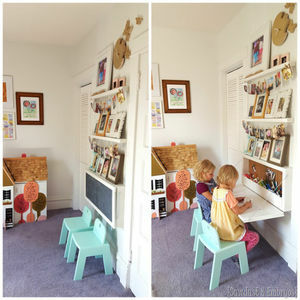 Jen at Craft-o-Maniac decided to use some dead space in her kitchen and dining area to setup this neat art station for her kids. The desk includes a built-in nook for storage, but a hanging clipboard, wire art display, and wipe erase calendar really bring it together. 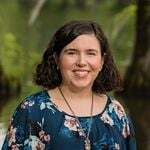 You can see a full explanation for the project, including Jen’s clipboard system on her website. 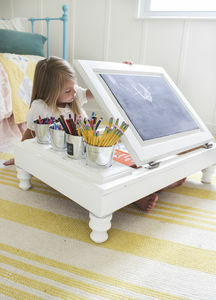 Creative little ones need a desk just as creative as them. This DIY cabinet desk was created from an old kitchen cabinet and includes a compartment for storage (paper, books, etc. ), tin buckets for writing and coloring utensils, and a chalkboard with lipped edge so the little pieces don’t roll away. Don’t have an old cabinet? There’s always someone renovating a kitchen, who would be more than happy to have one less cabinet to dispose of, so ask around. The tutorial can be found on the Shades of Blue Interiors website and can be altered according to the child’s needs (legs for height, casters for portability, etc.). We’re sure your child will love it! Sometimes simple is better. 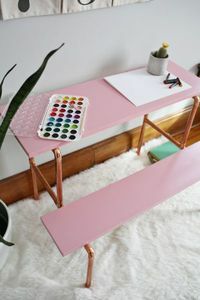 This copper pipe desk from A Beautiful Mess has built-in seating, so it’s kind of like half a picnic table. It’s stylish and easy to build, and the instructions (including pictures) are right on the website. It’s great for little ones, and when they outgrow it, you can use it to display planters. Has your toddler outgrown their crib? Don’t throw it away – repurpose it into a desk! 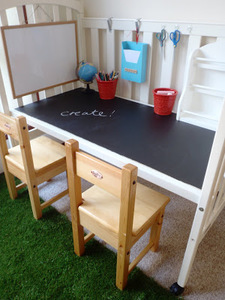 The folks at A Little Learning for Two took their daughter’s crib and made it into a perfectly-sized desk with hanging organizers and a chalkboard tabletop. You can see exactly how they converted the crib on their website. Looking for another example of a crib-to-desk conversion? 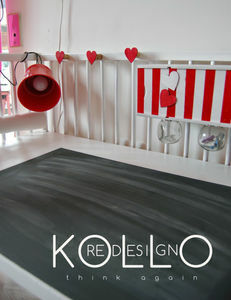 Kollo Redesign completed a similar project with a different style of crib. 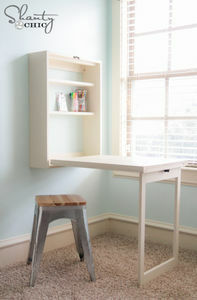 This pint-sized corner table is great for use in corner nooks. It sits two children and can be used in a myriad of ways. Plus, it’s short enough that you can still use the wall area above it for storage. Step-by-step instructions for creating it can be found on My Repurposed Life. Sometimes, all you need to make a homework\craft station fun is to add some color. 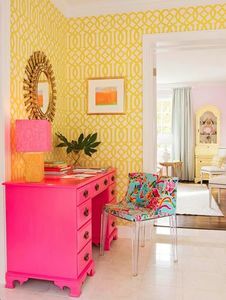 This traditional desk was painted a hot pink, something that could be done with a yard sale find. It could also be paired with some of the organization examples shared above. 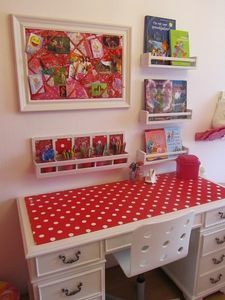 Lia at Mijn (My) Hobby Blog also gives a good example on how to add some color to a homework\craft station. 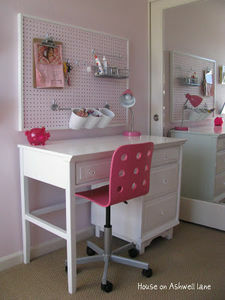 In her daughter’s room, she lined the top of the desk and the floating organizers above it with red polka dot fabric. It really helps to tie the space together. We hope you’re inspired by these examples. There are a lot of opportunities to mix and match ideas from the different projects. 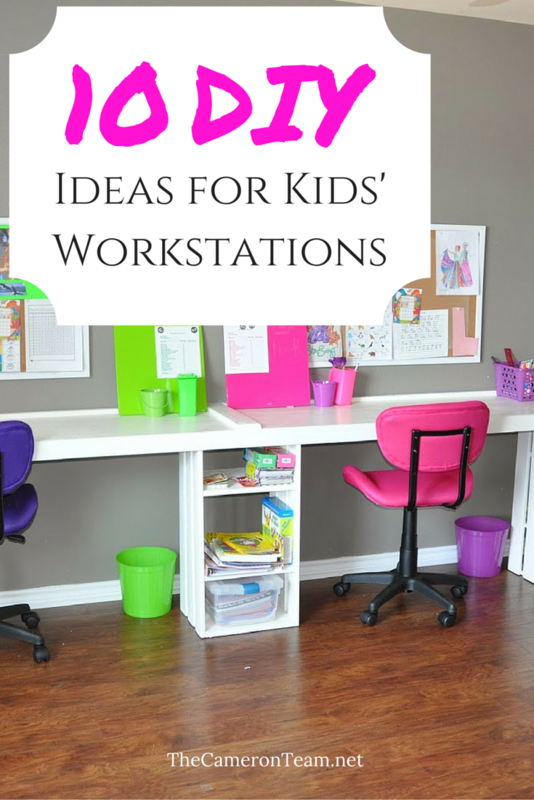 Need more tips for how to create the perfect homework station? View House Beautiful’s 12 tips.